Four teams which are scheduled to kick off the 2019 football season are yet to start preparations for the new season, with the first competition set for March 30. Football Association of Malawi (Fam) announced this week that the season will kick off with the Chifundo Charity Shield at Kamuzu Stadium in Blantyre. The association said the competition would involve TNM Super League champions Nyasa Big Bullets, Airtel Top 8 Cup kings Blue Eagles, Fisd Challenge Cup winners Be Forward Wanderers and Carlsberg Cup holders Masters Security. But the four are yet to commence preparations with less than two months to the official commencement of the season. Masters Coach, Abbas Makawa, who led his charges to their first-ever national trophy last season, said he was still on holiday. “Of course, we know that we will participate in the Charity Shield but it is too early for me to comment on the competition as we are yet to regroup for pre-season training,” Makawa said. Bullets are also yet to begin their pre-season training and are currently pre-occupied with finalising contractual issues with their coaching panel. The People’s Team has a coaching panel of three people whose contracts expired at the end of last season. These are Head Coach Kalisto Pasuwa, his assistant Heston Munthali and goalkeepers’ trainer Swadick Sanudi. This week, Wanderers have been conducting trials for players interested in playing for the senior, reserve and youth teams with the date for commencing pre-season preparations still unclear. Blue Eagles recently conducted a tour of several districts across the country in search of new talent to beef up their squad. Fam Commercial and Marketing Director, Limbani Matola, said the return of the cup follows a meeting which the association’s Competitions Committee held last weekend. “We have opted for the competition to be held in Blantyre because, in the last three years, it was taking place in Lilongwe,” Matola said. Proceeds of the competition will be channelled to charitable activities. Last year, Fam donated equipment to Kachere Rehabilitation Centre in Blantyre and Ekwendeni School for the Blind in Mzimba District. Bullets are the Shield’s defending champions, having defeated Silver Strikers 3-0 in last season’s final. 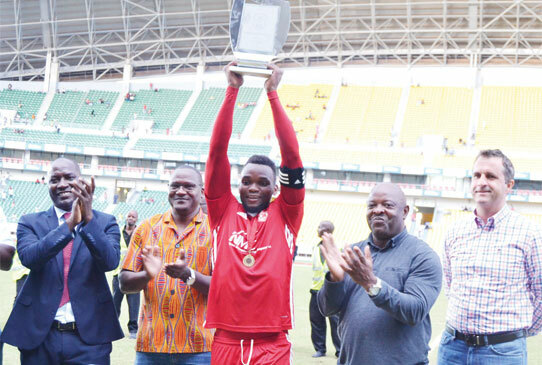 The return of the tournament means that there will be many football activities in March as Malawi under-23 and senior teams have Africa Cup of Nations qualifying assignments against Zambia and Morocco, respectively. Peter Mutharika’s second turn: is path paved, littered?